A crash for Christian Iddon in the closing stages of the opening race cost the Bennetts Suzuki rider a top-10 finish at Oulton Park and round nine of the MCE British Superbike championship triple-header weekend today. After qualifying in eighth place, Iddon made a steady start to the first of three races this weekend, holding 10th place early on. However, after making a series of passes, he soon found himself embroiled in a classic British Superbike dogfight for fourth place. But on lap 14 of 18, he crashed at high speed on the run from the ‘Shell Oils’ hairpin to the first chicane, ending his race and giving his team plenty of work to do for tomorrow’s two encounters. Josh Waters also found himself down a few positions off the start from his qualifying position, dropping as low as 23rd. 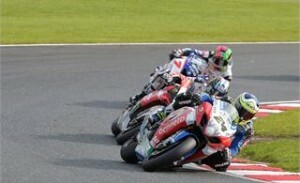 However, he kept his head down and worked his way-up to a point-scoring finish of 14th. “That’s not how we wanted it to go today. Christian was having a good race and an entertaining battle with all those guys around him; and we could have had a top-five result. Unfortunately he just pushed that bit too-hard to get the guys back in front of him towards the end of the race and it’s cost him a strong finish. But we’ll take the positive from the pace he’s shown as well as his determination to get a result, make some changes to the set-up, and go again tomorrow.